The Chief Executive and founder of Dell computers, Michael Dell, speaks at a product launch press conference in Shanghai, 21 March 2007. The special committee set up by the company to evaluate options for the troubled computer giant warned Friday of "substantial downside risk" if shareholders reject a buyout plan led by founder. The special committee set up by Dell to evaluate options for the troubled computer giant warned Friday of "substantial downside risk" if shareholders reject a buyout plan led by founder Michael Dell. In a document filed with US regulators, the Dell panel said the personal computer business appears even bleaker than earlier forecasts, and that Dell still relies on the PC segment for two-thirds of its revenues. The filing comes ahead of a July 18 shareholder vote on a $24.4 billion buyout plan, which would take Dell private and allow Michael Dell to restructure the company without the pressures of a publicly traded firm. But some news reports said Michael Dell, who is backed by the private equity firm Silver Lake, was being pressured to raise his offer to be able to win backing from a majority of shareholders. One key for the vote will be the recommendation of ISS, a proxy advisory firm. Corporate raider Carl Icahn and his investor allies have called the buyout plan a "giveaway" and are pressing for an alternative plan that could keep Dell public, with an injection of cash in a so-called "leveraged recapitalization." The document filed with the Securities and Exchange Commission said, however, that Dell's planned turnaround is at risk because of trends in the PC business, and it cited a Morgan Stanley report which said global PC sales will sink 10 percent this year, far worse than earlier forecasts. "PC exposure will likely continue to weigh on Dell's share price, regardless of the enterprise trajectory," the document said. It also said Icahn's valuation for the company is based on "unrealistic" assumptions, citing Hewlett-Packard for comparison. Using the price-to-earnings ration of HP, the panel said Dell could be valued at between $5.85 and $8.67 per share, compared with $13.65 under the private equity plan. The document included a chart with these figures, with a headline stating, "Substantial downside risk to Dell shareholders if transaction rejected." The New York Times reported this week that the special committee is worried the buyout offer will fail to win a majority of Dell shares. The Dow Jones news site AllThingsD said some at Dell fear a rejection could create a chaotic situation at the former number one PC maker. Icahn said this week he had obtained commitments for more than $5 billion in financing for an alternate plan. He would offer $14 per share for as much as 72 percent of outstanding shares, but added that he and other stakeholders may hold onto their shares if they believe, "like us, that Dell's best days are ahead of it." Dell shares fell 2.03 percent to close at $13.04. Dell unveiled plans to go private in February, giving Michael Dell a chance to reshape the former number one PC maker away from the spotlight of Wall Street. 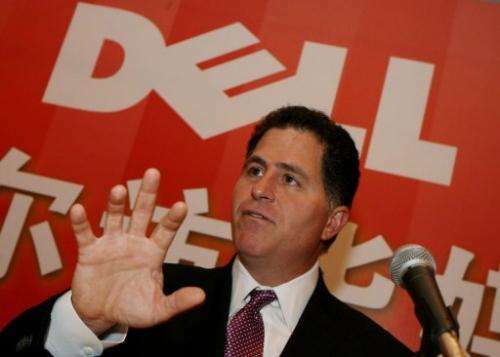 The special committee on June 5 endorsed the Michael Dell proposal "as the best option for shareholders." Roger Kay, analyst with Endpoint Technologies Associates, said Dell's situation could rapidly deteriorate if ISS recommends rejection of the buyout. "If it does, shareholders will likely vote against management, and the stock will fall back to pre-deal levels," Kay said. "If Carl Icahn assembles a package that on the surface looks better, the company is in big trouble. He and his associates will strip the company of operating capital to pay 'special dividends' out to themselves and leave nothing but a carcass."